Members of our lab perform a number of outreach activities to update the public about our ongoing research on stickleback fish and pigeons. 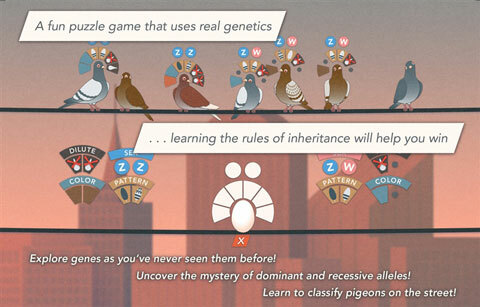 Become a virtual pigeon breeder with a fun online game produced in collaboration with the award-winning Genetic Science Learning Center! 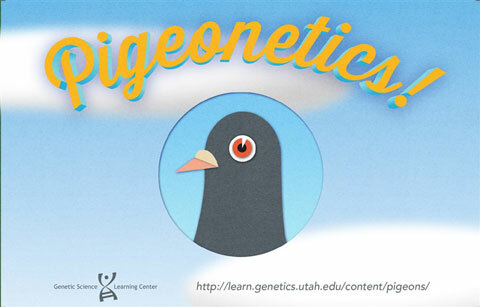 Click here to go to the home page for pigeon heredity and genetics educational resources on the Learn.Genetics website. 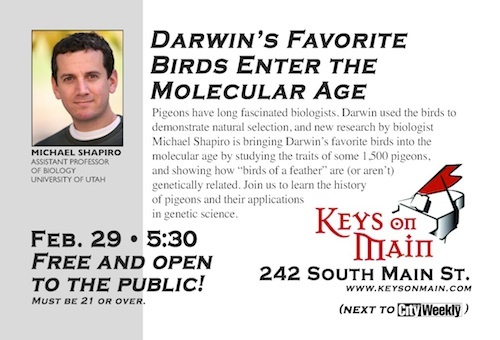 Mike gave a presentation at Keys on Main in downtown SLC about our lab's pigeon genetics research. We had an outstanding turnout by College of Science affiliates and the general public. Congratulations to Science Fair Winners! 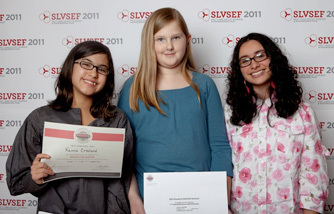 Salt Lake Center for Science Education students Kanna Crosland, Sarah Christensen, and Varesh Gorabi recently received a Broadcom MASTERS Award at the 2011 Salt Lake Valley Science and Engineering Fair for their project titled, "Pigeon Smarts." This ambitious project investigated the abilities of different breeds of pigeon to recognize themselves in a mirror. Moani Tuitupo, Kyle Kelly, and Elliot Powell-Hamilton were recognized with an Honorable Mention in the Biology & Biochemistry division for their project, "Fancy vs. Feral in the Battle of the Sound," a study of acoustic sensitivity in pigeons. Both groups were mentored by graduate student Sydney Stringham. 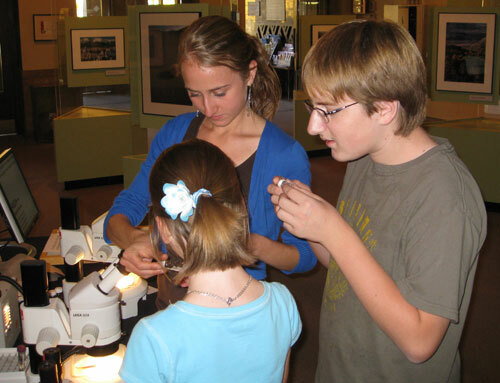 The Scientist in the Spotlight program provides a forum for the public to interact with local scientists. 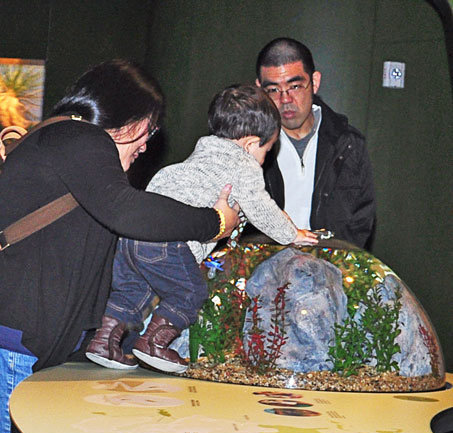 This program gives kids and adults a chance to see what it's like to be a scientist through hands-on activities and demonstrations, as well as through face-to-face conversations with university faculty and students. We hosted a session that focused on our stickleback genetics research that included a opportunities to see live sticklebacks, try out collection gear that we use in the field, and view a diverse set of skeletons under a microscope. 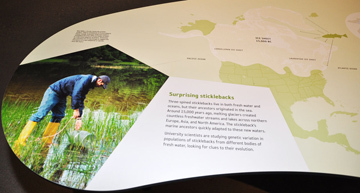 In collaboration with Museum staff, we helped design content for a new, permanent exhibit about sticklebacks in the new Rio Tinto Center. Mike served as a lecturer in the Genetic Science Learning Center's summer course on Genome Science. This course hosted approximately 80 high school teachers from throughout the country and featured lectures from several University of Utah faculty. Mike's lecture was an ideal chance to disseminate our stickleback and pigeon research to a broad audience, and equip teachers with examples of modern evolutionary genetics research to pass on to their students. We also plan to work with the Center to develop a new genetics game for their enormously popular website. Our pigeon research depends on the generous assistance of hobbyists on the local, national, and international levels. 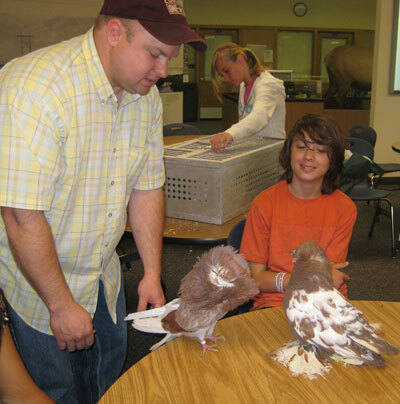 We keep these collaborators up to date on our research through interactions at local meetings of the Utah Pigeon Club as well a at local, national, and international shows. Graduate studnet Sydney Stringham was a fellow in the NSF-sponsored Think Globally, Learn Locally (TGLL) program. As a TGLL fellow, she collaborated with 6th grade teachers at the Salt Lake Center for Science Education to design new hands-on science curricula, including lessons based on our lab's stickleback and pigeon research. Sydney, Mike, and local pigeon breeders Jim and Mariah Oldham gave a presentation about anatomical and behavioral diversity among different breeds of pigeons. Jim and Mariah were outstanding ambassadors of the hobby and were very kind (and trusting!) 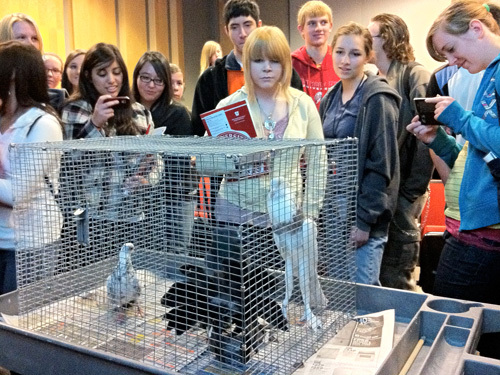 to bring several different breeds of pigeon for this hands-on session. 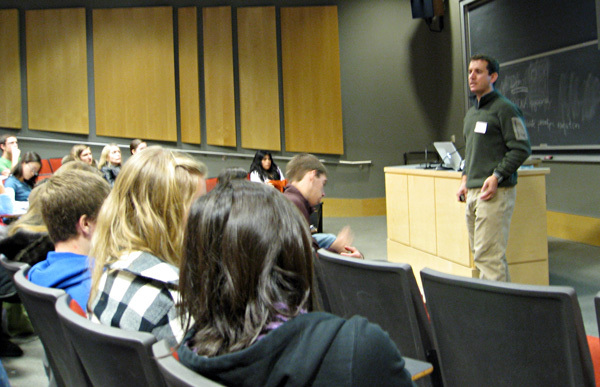 For the past two years, Mike Shapiro and Richard Clark have given presentations on "Varying Genomes" for over 100 participants in the College of Science's annual Science Day for high school students from Utah and Idaho. Mike and Richard discuss the genetic factors influencing variation in plants and animals, including humans, and students have a chance to explore examples of variation from our stickleback and pigeon research in a hands-on session.